As you walk you will meander your way through giant mountain ash forest, the tallest flowering plants in the world, and along some of the most remarkable pristine beaches in Australia, then traverse massive sea cliffs, that have made this location famous. There’s also ample opportunity to spot wildlife in their natural habitat, from kangaroos to wallabies, echidnas and koalas, to black cockatoos, sea eagles, wedge-tailed eagles, dolphins and whales. This Great Ocean Highlights Walk includes the Twelve Apostles, plus more stunning views as you progress along the track at Castle Cove and at The Gables, as well as Wreck and Johanna beaches. The pristine nature and deafening surf make Johanna Beach one of the ultimate beach walks. The breathtaking and deserted coastal landscapes, ancient Gondwana forests of Antarctic beech, shady wooded glades and heathland plateaus are the backdrop to a walk that will inspire, challenge and reward you with a real sense of accomplishment. The Great Ocean Walk is also available as a 7-day group guided walk or a longer 8-day self-guided walk. Start in Apollo Bay or Castle Cove on the Great Ocean Road, any time after 1 pm. If you’re arriving by public transport to Apollo Bay you will be met here and transferred to your first night’s accommodation. If you’re arriving by a private vehicle you are able to park the car at your first nights’ accommodation for the remainder of the trip (we will transfer you back to it at the end of your holiday). You will have plenty of time to explore either the lighthouse and its historic lighthouse keepers cottages, or the Eco Lodge and their conservation efforts. We start our trek on the Great Ocean Road Highlights at the lighthouse hiking via Station Beach and an optional short trek to Rainbow Falls where a spring cascades down to the rocky coastal platforms below. The track then continues through the wind-sculpted sand dunes and along the cliff tops to the Aire River estuary and wetlands. Stunning coastal scenery awaits on the route to Castle Cove. Milanesia Beach is one of those secret beaches not many people get to if they are just driving the Great Ocean Road – and what a special place it is. From here, the track continues along the cliff tops and you can see all the way back to Cape Otway Lighthouse. High sea cliffs, breathtaking views and coastal forests lead you to Moonlight Head. The first highlight today is The Gables Lookout, perched on one of the highest sea cliffs in mainland Australia. This is a superb spot for whale watching between June and September. Continue through a grove of casuarinas to Wreck Beach where the remains of two shipwrecks can be inspected. Today’s walk finishes at the impressive Twelve Apostles, a group of limestone sea stacks that are constantly changing. After breakfast, you will be provided with a guided tour of Loch Ard Gorge. You will have time to explore the area and its many tracks before being transferred either back to Cape Otway Lighthouse or Eco Lodge (if you arrived by car) or to Camperdown for public transport connections. The Great Ocean Road walk is relatively easy to negotiate as the track is well graded and well cared for. Full days walks average about 14km. There are great opportunities for fit walkers to challenge themselves on least two of the days. All of the accommodations are more than comfortable and all rooms have ensuites. Your first night will be spent at either the Great Ocean Eco Lodge or the historic Cape Otway Lightstation. Both properties offer something a little extra, an opportunity to learn all about the conservation efforts at the Eco Lodge on a guided evening walk or the exclusive use of the Lightstation’s environs are special starts to your walk. The Aire Valley Guest House and Great Ocean Walk Retreat are the next stop where you’re in for a showcase of regional produce for breakfast, lunch and dinner. Where they can organic produce is incorporated. Finish your experience off with Southern Anchorage and then the Portside Motel. Both properties are conveniently located, Southern Anchorage on a beautiful bush setting on the edge of the national park and Portside Motel in the centre of the quaint town of Port Campbell. When we stay at remote retreats and guest houses the meals are prepared by your expert hosts or a local caterer. The days start with cooked breakfast and end with a 2 course meal accompanied with a glass of wine (or a beer) if you so choose. Each day you’ll be provided with a substantial walkers lunch and the opportunity to enjoy it whilst taking in some of the most breathtaking views in the world. A walkers lunch is varied and may include a high protein type salad, roll or a wrap, muesli bar, cake or muffin and a piece of fruit. By the way the former Head Ranger who was pivotal in the designing of the track also guides your tour at Loch Ard Gorge on the last morning. He’s a wealth of knowledge and also great company so you can look forward to a fascinating morning of walking and exploring. You will be picked up from Apollo Bay (about 3 hours SW of Melbourne), if you arrive by public transport, then transferred to your first night’s accommodation at Cape Otway Lightstation. There are daily train/coach services from Melbourne. If you’re arriving by private vehicle then you will able to drive the Great Ocean Road and park the vehicle at Cape Otway Lighthouse for the duration of your holiday. The holiday finishes with a transfer back to your car or to Camperdown for public transport connections back to Melbourne. More detail regarding transfers is available, so please contact us. Each day we move your luggage ahead for you to the next accommodation. 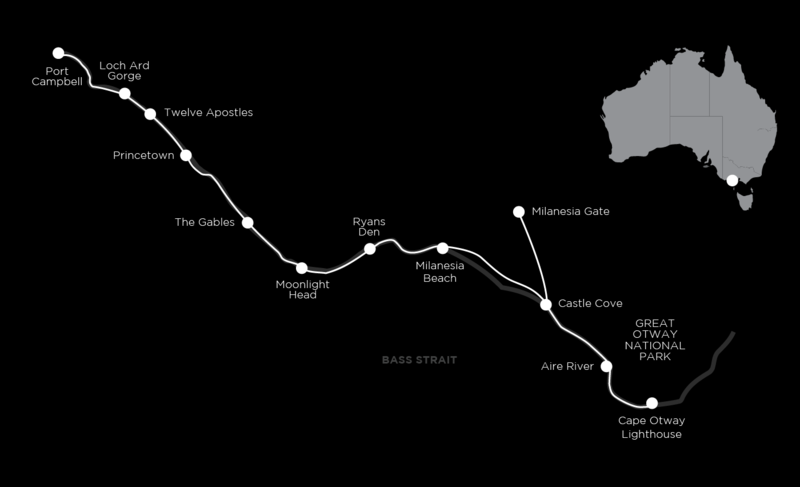 We’ve mapped a point-to-point walk to maximize the Great Ocean Road highlights, staying in different accommodation on the route. This means more variety and less backtracking and time spent in a vehicle for more time to relax at the end of the day. You’ll walk an average of 15–16 km each day, with some optional side walks for those wanting to extend themselves. The walking terrain is varied following cliff tops, wide forest tracks, beach traverses including Wreck Beach and some shaded forest canopy. It’s relatively easy going, flat stretches, with a couple of steady but challenging climbs. The walk is rated overall as easy to moderate. Weather for a Great Ocean road trek: December through February is usually warm to hot with excellent swimming weather. Book well in advance for January due to the summer school holidays. March through May is usually cooler, with long sunny days, perfect for walking. The winter months (June to August) are cool and sometimes stormy, providing exhilarating walking along the beaches. In winter, the hills are covered with pink heath, Victoria’s floral emblem. September and November are usually cool to warm and this is when most of the colourful wildflowers appear. We strongly recommend purchasing a travel insurance policy as we charge a cancellation fee if you cancel your Great Ocean Walk Highlights holiday after we have confirmed it. We offer a 30% discount on travel insurance booked via our website. Get an instant quote and purchase online now. If you have any questions about the Great Ocean Walk Highlights, feel free to ask one of our destination consultants or to speak with one of our guides. You can get in touch with us via our contact form, email us at info@auswalk.com.au, or call us on +61 3 9597 9767.